Feeling overwhelmed by unreliable news and information? The library is here to help! You deserve the truth. You are smart enough to make up your own mind - as long as you have the real facts in front of you. You have every right to be upset when you read fake news. Fake news can hurt you and a lot of other people. Purveyors of fake medical advice like Mercola.com and NaturalNews.com can help perpetuate myths such as that HIV and AIDS aren't related or that vaccines cause autism. These sites are heavily visited, and their lies are dangerous. Real news can benefit you. If you are writing a research paper, your professor will expect you to vet your sources. If you are planning on voting in an election, you want to read reliable information on a candidate so that you can vote for the person who best represents your ideas and beliefs. Fake news will not help you get a good grade or make the world a better place: real news can. Fake News, Alternative Facts, and Post-Truth, Oh My! Have you recently had a close friend or family member shock you with any of the following stories or information? You might have heard any or all of these stories; however, there is one thing that connects all of them: they're not true. 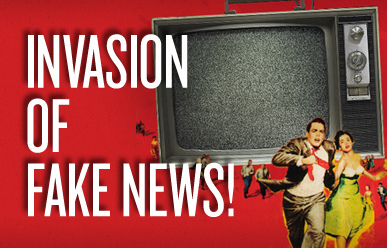 The ability to discern accurate news and information from fake news and misinformation is a critical skill that you will use for the rest of your life. This LibGuide will give you valuable insight into telling fact from fiction online. 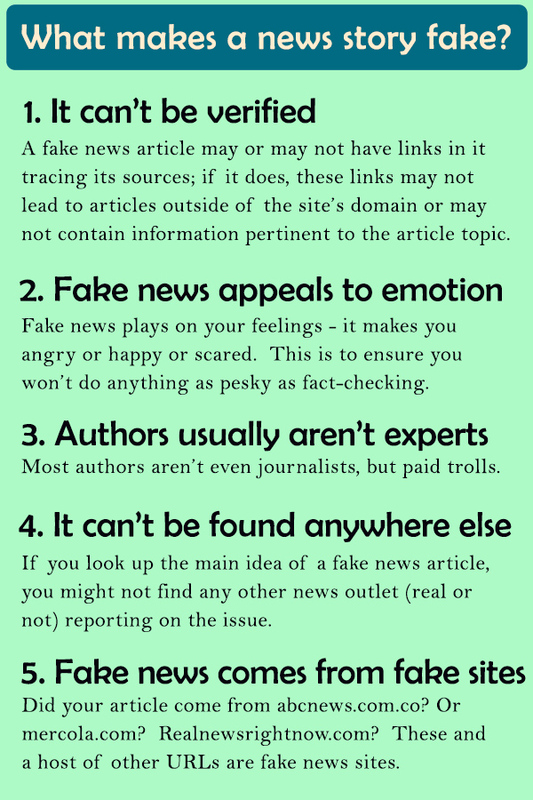 According to media professor Melissa Zimdars of Merrimack College, there are four broad categories of fake news. No single topic falls under a single category - for example, false or misleading medical news may be entirely fabricated (Category 1), may intentionally misinterpret facts or misrepresent data (Category 2), may be accurate or partially accurate but use an alarmist title to get your attention (Category 3), or may be a critique on modern medical practice (Category 4.) Some articles fall under more than one category. It is up to you to do the legwork to make sure your information is reliable. However, the resources below can be a good starting point in determining if your source is unreliable. Annotated list by Melissa Zimdar of Merrimack College. *Note: this list is a work in progress. Sites that intentionally publish hoaxes and misinformation to drive web traffic rather than for a humorous purpose, as in news satire. Are you concerned with the increase in fake news and misinformation? As a producer and consumer of information, you can make a difference. Here are 6 ways you can make a difference NOW by evaluating and engaging. 3. Install a browser extension that identifies stories from sites that produce clickbait, fake news, and other suspect stories. 6. Think critically about your sources. While technology can be useful in identifying fake news and misinformation, you shouldn't rely solely on online tools. These tools can still fall victim to human error and bias.